We have been looking at ways to stop bullying by celebrating how unique and wonderful we all are. 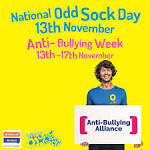 On Monday we took part in the National Odd Socks day to show that we are all different individuals but we are all equal and have a role to play in making up our school. We also thought about how hearing people say unkind words to someone can make that person feel sad and alone. In Ash class we thought about the story of the Ugly Duckling and even though he was happy in the end, we didn't think he should have been called names because of the way he looked. We re-wrote the story to celebrate that the (Not-so) Ugly Duckling was just as loved as the other ducklings. In the second week of our antibullying fortnight, we have used our new knowledge on capacity to make an antibullying potion by adding ingredients such as half a cup full of friendship and three quarters of a cup full of kindness.